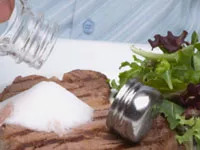 WEDNESDAY, Jan. 20, 2010 (Health.com) — If Americans cut their salt intake by just half a teaspoon per day, it would produce public health benefits on par with reducing high cholesterol, smoking, or obesity, a new study has found. The number of heart attacks in the U.S. could decline by up to 13% if adults could just slash their daily salt intake by 3 grams, or about 1,200 milligrams of sodium, according to the study, which was published Wednesday in the New England Journal of Medicine. New cases of heart disease and the number of strokes could also be expected to decline, by up to 11% and 8%, respectively. To achieve a similar reduction in heart attacks and other heart-related problems, the researchers estimate, nationwide tobacco use would need to be halved. Alternatively, obese adults would need to reduce their body mass index by 5%, or all adults at low-to-medium risk for heart disease would need to take cholesterol-lowering statins. Even a reduction in daily salt intake of just 1 gram (or about 400 milligrams of sodium) would produce "large declines" in the rates of cardiovascular events, according to the study. "Just targeting slightly lower salt [intake] would have some benefit for everyone in the U.S.," says the study's lead author, Kirsten Bibbins-Domingo, MD, an epidemiologist and assistant professor of medicine at the University of California, San Francisco. "This is the ideal type of intervention for those who are interested in public health to get behind, because the effects would be so dramatic." The study suggests that food manufacturers would need to be the primary target of the projected reduction in salt intake, since processed foods—and not the salt in your salt shaker—account for between 75% to 80% of American salt consumption. "I got interested in this work because, once I started looking at the labels, I was shocked by how much salt I had no control over," Dr. Bibbins-Domingo says. Seemingly healthy staples such as breakfast cereal, pasta sauce, and sandwich bread likely contain more salt than one would think, she adds. "It's hard for me to tell my patients to make different choices, because it's hard for me to make different choices." Dr. Bibbins-Domingo and her colleagues at UCSF estimated the benefits of salt reduction using computer models. The models, which took into account heart disease risk factors such as systolic blood pressure, cholesterol levels, and smoking status, relied on data from government sources and previously conducted studies. The models assumed that salt intake is directly linked to blood pressure, and that blood-pressure levels have predictable effects on cardiovascular risk. Research has shown that excessive salt intake is associated with high blood pressure (or hypertension), which can damage the arteries and lead to heart disease, stroke, and other health problems. The U.S. Department of Health and Human Services recommends that adults limit their daily salt intake to 5.8 grams, or about 2,300 milligrams of sodium. (Sodium is a component of table salt.) People who are especially sensitive to salt—such as blacks, hypertensives, and adults over 40—should limit their intake to 3.7 grams a day, or about 1,500 milligrams of sodium, the agency says. The average American eats far more than the recommended amount of salt in a day, however. American men and women consume about 4,178 and 2,933 milligrams of sodium per day, respectively, government data show. "I think a public-health policy is in order," says Cheryl Anderson, PhD, an assistant professor of epidemiology at the Johns Hopkins Bloomberg School of Public Health, who co-wrote an editorial that accompanies the study. A "more concerted and dramatic" effort that includes educating individuals about the dangers of excessive salt as well as the participation of public agencies and health organizations is needed, she says. "It's time to take the responsibility fully off the individual, because it hasn't worked," says Anderson. "We've been trying that for a long time now, and the problem of elevated blood pressure is still here." The study comes at a time when cities and states in the U.S. are taking steps to reduce the salt intake of its inhabitants. Most notably, the New York City Department of Health announced last week that it would spearhead a nationwide effort to cut the population's sodium intake by 20% over five years, in large part by persuading the manufacturers of prepackaged foods to reduce the amount of sodium in their products. The campaign, known as the National Salt Reduction Initiative, is modeled on a similar campaign in the United Kingdom and has been joined by a host of professional organizations (including the American Medical Association and the American Heart Association) and departments of health in numerous major cities and states, such as Chicago and California. Dr. Bibbins-Domingo says that her study was prompted in part by the realization that the U.S. was "lagging just a little bit behind" other countries in addressing the health effects of salt intake. (In addition to the U.K., countries such as Finland and Australia have begun salt-reduction campaigns.) The study, she says, was intended to provide rough estimates that would help guide policymakers in making decisions. "We're taking data from other studies—clinical trials of lowering salt [intake] and the effect of blood pressure on heart disease," she says. "We're taking those data and saying, 'What if we did this thought experiment, and actually applied the effects of these types of interventions across the whole U.S. population?" The salt reduction proposed in the study would reduce health-care costs by $10 billion to $24 billion, Dr. Bibbins-Domingo and her colleagues estimate. Salt-reduction campaigns have been controversial. Some experts maintain that the evidence linking dietary salt intake and blood pressure isn't strong enough to justify public policy and regulation of the food industry. David McCarron, MD, an adjunct professor of nutrition at the University of California–Davis and the president of Academic Network, a health-care communication company in Portland, Ore., says that Dr. Bibbins-Domingo and her colleagues were overly reliant on studies that are of questionable validity. "This is not a study. This is nothing but a computer-generated number," says Dr. McCarron, who has consulted for the food industry and the Salt Institute, a trade association. "Any time you model something, it's only as good as the basic assumptions you put in it." Although she acknowledges the methodological limitations of the study, Dr. Bibbins-Domingo dismisses the argument that the evidence on the health effects of salt isn't strong enough to support a public-health initiative. "The existing evidence is overwhelming," she says.